Give your brand a voice - and your customers a better experience. Provide customers more control over how they interact with your brand. The Voice On-Demand platform creates a rich, personalized, buying experience that empowers customers, improves compliance, and offers better ways for marketers to optimize every step in the buyer journey. Use Voice On-Demand for Care to reduce hold times, improve overflow management, automatically field customer service inquiries and create more loyalty for your brand. Drive Conversion with Turn-Key Voice. Ignite-TEK's SaaS-enabled IVR maximizes revenue for business owners by offering inbound voice solutions from both IVR and Live agent hybrid models. The incremental lift achieved lowers costs inside while also giving customers a more consistent buying experience. Enable automated voice shopping for products. Americans choose to use the phone to make a purchase. Callers prefer an automated ordering option. Customers prefer to call the contact center to deliver meaningful feedback. Ignite-Tek’s team of programmers, writers, and QA reps complete a turn-key IS-IVR implementation for all inbound campaigns. The team connects the dots between media buyers, production, fulfillment, customer care, and operations and ensures campaigns are up and running in no time. Marketers get real-time reporting tools that provide continuous and comprehensive insights into the most meaningful metrics such as call volume, conversion, revenue per order, returns and more. Ignite-Tek creates a multi-level optimization strategy which pinpoints opportunities and creates new tests to improve conversion through script adjustments, call flow logic, pricing and upsell strategies, offer complexity analysis, customer drop-off surveys, post-sale returns, and more. Gain More Value from Every Inbound Interaction. Ignite-Tek’s team of experts is comprised of Industry veterans who implement best practices, analyze all components and variables of the business, and address areas that can be improved to directly align with clients’ specific goals. Services provided may include scripting creative, pricing adjustments, upsell and call flow logic, simplification of offer, and more. Your customers want to speak to you. Transparent and Comprehensive Reporting Tool to Improve Media Buying and Effectiveness. As a leader in the direct marketing industry, Ignite-TEK understands the need for immediate and robust reporting to make decisions fast. Velocity provides real-time reporting, integrating all transactions and tying them directly to media spend. This transparency allows clients to evaluate the impact of media expenditures by channel and media outlet for smarter real-time targeting. Velocity provides real-time data on key metrics to allow clients to effectively manage their media, offer and scripting decisions to optimize ROI against media dollars. Integrated data platform helps determine which customer segments and which channels drive performance on a campaign-by-campaign basis. 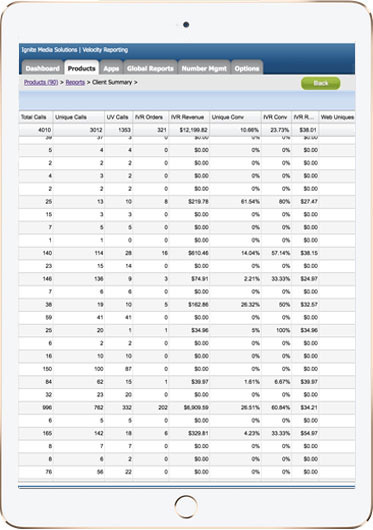 Perform quick campaign analysis to translate media costs into ROI. Velocity also allows clients to drill down to the granular details, such as analysis of script performance, to identify areas for improvement or additional revenue opportunities. How can we help your media campaign?